This page is under construction to reflect the status of IM in December 2012. Presence: to let your contacts know your current status according to the options shown at the right. Chat: to drive informal and ongoing text message conversations. Group Chats – a persistent, closed chat session where (a) host(s) can invite Contacts as participants and manage an ongoing conversation. Think of it as a “by-invitation-only” water cooler conversation. Public Chats – a persistent, open chat session where (a) host(s) can publish a public access link (or URI) and anyone on Skype can join in. In this case hosts have control over whether a participant is active, read only or (if necessary and appropriate) blocked from participating. Think of public chats as a public town hall meeting. All chat activity on a PC is stored on the local PC and is searchable (Ctrl-F or Control-F). Scrolling to the top of a chat window provides options to recall all activity going back seven days, 30 days or longer as shown on the right. VoiceOnTheWeb.biz Visitor Water Cooler hosted by Jim Courtney. Chat about using Skype for business conversations -voice, text and/or video. More about public chats. Group and Public Chats are the most powerful in a business or group setting. The host can designate a topic and provide reference URL’s for the session which assist in keeping the session on focus by providing reference points for new participants or those who drift too far away from the main focus. These chats can go on infinitely in time. 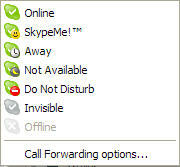 Several have been running 24 hours/day, 7 days/week since the introduction of Public Chats with Skype 3.2 in May, 2007. Thus, the term “Virtual Water Cooler Conversations”. As a demonstration of Public Chats we will be hosting the Public Chat session shown on the right. Any visitor with a question about the site can click on the link to the right and join the session.